I've been anticipating Marvel Vs. Capcom 3 for almost ten years. While it was great for Marvel Vs. Capcom 2 (released in 2000) to get a semi-follow up in the form of Tatsunoko Vs. Capcom last year, it felt a little anti-climactic. Tatsunoko Vs. Capcom is an incredible game, but I think it's fair to say that Marvel Vs. Capcom 3 is the title that fans have really been waiting for. Sadly, I've had reason to feel that Marvel Vs. Capcom 3 might also end up being a bit anti-climactic. For one, it doesn't have as many new characters or fighting mechanics as Tatsunoko Vs. Capcom (at least on the surface). It also has a smaller roster than Marvel Vs. Capcom 2, with series mainstays like Mega Man and Strider cut from the team. It doesn't even have the vibrant, expressive animations and character models of Super Street Fighter IV. On first sight, it's all a little troubling. Now that I've finally got the game, I'm troubled no more. 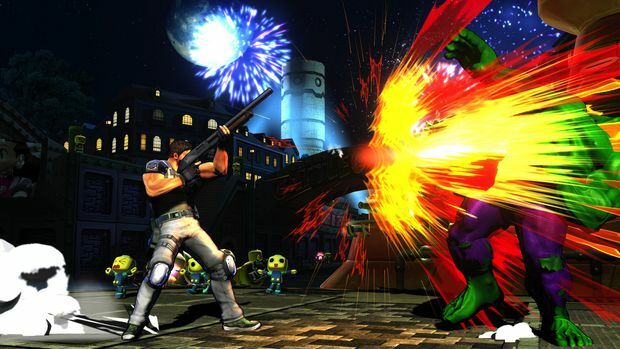 After a few solid hours with Marvel Vs. Capcom 3, I quickly learned to stop comparing it to the past games in superhero rave series, and just love it for what it is. This game is its own animal, and it's an awesome animal. I'd go as far as to say it's... a power animal. 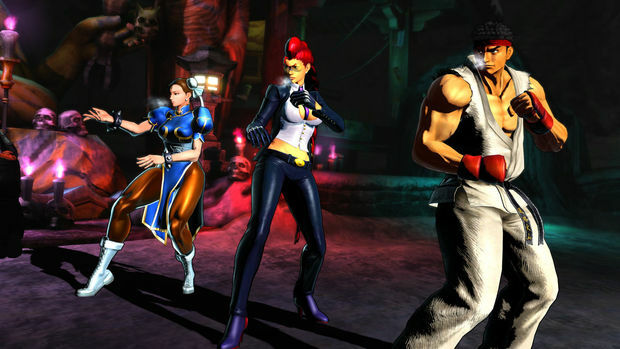 Marvel Vs. Capcom 3 works as both a reboot and a sequel to the Marvel Vs. Capcom 3 series. It has more new characters and new systems than any Marvel Vs. sequel yet. Old school fans will still feel right at home here, as the spirit of the series remains mostly intact, and about half of the characters are returning from either Marvel Vs. Capcom 2 or Tatsunoko Vs. Capcom. That means tag-team matches, limited healing factors for all characters, an emphasis on air combos, multi-character special and super moves, and what is generally thought of as the most flashy, insane, potentially seizure-inducing fighting game series known to man. There is even a warning when you boot up the game that the "flashing lights" and to consult the manual for detials . This game is serious business. Sounds good, right? Well, in practice, Marvel Vs. Capom 3 tries a little too hard to please everybody, and as a result, it doesn't quite manage to pull everything off. 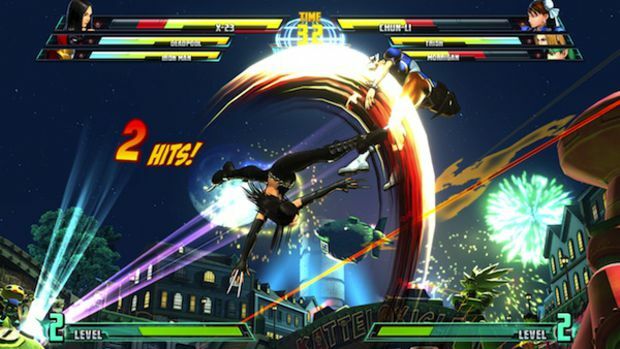 Just as it's not possible to be in two places at once, it probably wasn't realistic for Capcom to try to make Marvel Vs. Capcom 3 a game that both revolutionizes the superhero rave while simultaneously retaining so many of the characters, combos, and techniques from Marvel Vs. Capcom 2. Thankfully, at it's worst, Marvel Vs. Capcom 3 is still a true love letter to the Marvel and Capcom universes. At it's best, it's the fast-paced, exciting new fighter frontier that offers endless potential for exploration and mastery. Lets start with the story. Told mostly through the game's opening cut scene, we see the various characters from the Capcom and Marvel universes fighting it out. Then something about the dread Dormammu shooting fireballs happens, and after that, Galactus wants to eat. That's it. Unless I'm missing something, that's all there is to the game's narrative, other than a few plot points revealed in the character's endings and a few bonus movies. The game's opening cinema is really more of an excuse to see at how awesome this game looks. It utilizes a combination of cel-shading, inky textures, and highly detailed polygon models to create a look that truly feels like a comic book (probably drawn by Jae Lee) come to life. Sadly, things go down hill from there, at least visually. 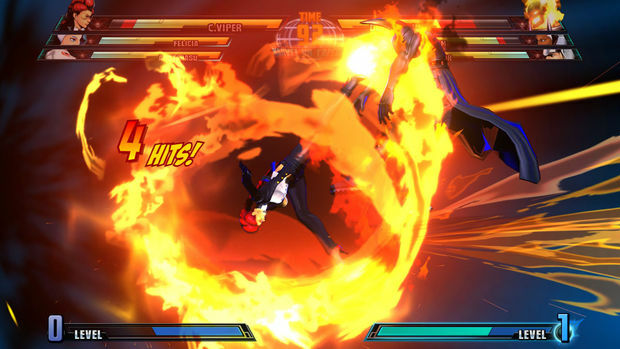 To be clear, there is nothing bad about the way Marvel Vs. Capcom 3 looks. It's all very well crafted, solid, and expensive looking. That said, the full game isn't half as visually expressive as that opening cinema would lead you believe. The inky textures immediately disappear once you start playing, leaving things looking a lot less bold and vibrant. Some characters (like Deadpool, Sentinel, Zero, Tron Bonne, and Hsien-Ko) still look great, but on the whole, the game's cast doesn't come to life the same way the did in its sprite-based predecessor Marvel Vs. Capcom 2, or even Capcom's most recent polygon based fighter Super Street Fighter IV. It's not a deal breaker though. After playing Marvel Vs. Capcom 3 for an hour or so, I totally adjusted to the game's stylistically conservative polygon models and animations. The constant explosions and laser blasts also do a lot to make up for whatever the character models lack in punch and pizazz. Maybe Marvel Vs. Capcom 3's characters are a bit restrained in terms of graphic design because the cast allows for such varitey. The straightforward, cohesive art direction does do a lot unify this truly bizarre roster of fighters. The game has 36 characters (and one unplayable boss) split pretty much down the middle between the new and the old. Though a few of the veteran characters seem more or less identical to how they were in Marvel Vs. Capcom 2, a lot of the returning fighters have some pretty substantial tweaks that make them feel fresh. For instance, Viewtful Joe now has an uppercut move that has effectively taken him from being incredibly difficult to learn to a fighter that just about anyone can pick up and play. Thankfully, adding this new move didn't require Capcom to sacrifice any of Joe's legitimacy. Even with this new move, he still plays and feels just like he did in his games. That's true of all of the Capcom characters here. It's a minor miracle that Capcom has managed to keep each and every entry character true to their various source materials. Ameterasu (from Okami) still makes flowers grow wherever she walks, and she can switch weapons on the fly while attacking enemies with ink drawings, just like she can in her game. Dante has nearly all of his moves from the Devil May Cry series, plus a few new ones that perfectly fit his badass/cornball personality. 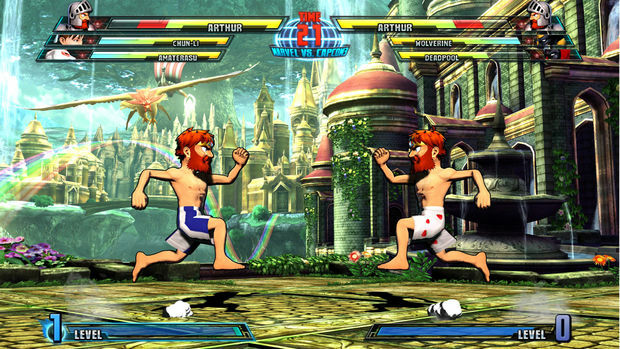 Arthur and Haggar look and fight exactly as they did in their classic games, except with added polygon polish, and the speed and maneuverability they need to compete in this superhero-packed playing field. The game may have everything from wolf godesses to giant head floating head as characters, but it still doesn't quite feel as varied as Capcom's prior Superhero Vs. titles. There were quite a few iconic characters cut from Marvel Vs. Capcom 2. There is no Mega Man, no Strider, no Cable, and no Cyclops. Part of me is happy about that, as when I buy a new game, it feels good to see new content prioritized over recycled material. On the other hand, they could have easily included more Marvel and Capcom icons from prior games with overhauled appearances and fighting styles, like Capcom did for Roll in Tatsunoko Vs. Capcom. Maybe it sounds like nitpicking, but just feels wrong to see so many Marvel and Capcom all-stars and cult favorites dropped, while characters that nobody has a strong affinity for (like She-Hulk, C. Viper, X-23, and Trish) make the cut. Maybe Capcom thinks fans want more half naked women in their fighting games, and fewer relics from the NES and arcade days? It's hard to say. Seeing old characters dropped in favor of new cheesecake isn't the only change to the game's roster. 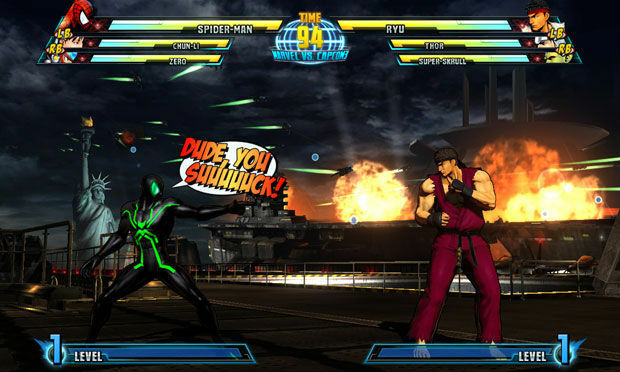 Overall, Marvel Vs. Capcom 3 feels decidedly more serious than its predecessor. There are no random cactus men to be found here. The music is also a lot more straight laced, though "Take you for a ride" does make a welcome comeback. Other than the inclusion of that ridiculous song, and the game's often hilarious pre-fight banter, (particularly from Deadpool, who actually welcomes Mageneto "to die" at one point), Marvel Vs. Capcom 3 has largely lost the goofiness that off-set the superhero insanity in prior titles. That brings us to the game's sound design. It's truly excellent, easily the best in the series. Everything from the score to the writing to the voice acting is top notch. Each of the game's characters has their own theme song. For Capcom characters, it usually something from their past games, while the Marvel side has mostly original compositions. Either way, all the music here sounds fantastic. Then there is all the pre-fight dialog I alluded to. For starters, the game lets you play with Japanese or English voice acting, which is great if you're the type who grows tired of the same old language day in and day out. I don't think you English speakers out there will get sick of the game's performances though. I've been setting up matches just to here what the characters say to each other, and it's not getting old. Iron Man hitting on Tron Bonne, Haggar... being Haggar, it's all gold. I think it will be a long time before I've heard it all, and even longer before it makes me stop smiling. Nine paragraphs in, and I haven't gotten to what really counts the most to a fighting game; the balance. So far, it's hard for me say anything bad about Marvel Vs. Capcom 3 tiers. 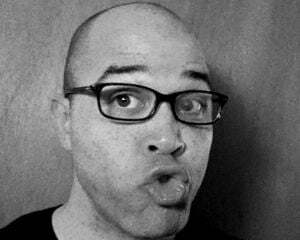 There are definitely characters that are more dangerous than others (I'm looking at you Phoenix), but there is usually a damage resistance differential to make up for that. Most importantly, overpowered bastards from Marvel Vs. Capcom 2 (like Sentinel, Storm, Magneto, and Doctor Doom) don't seem to have all the same advantages that they used to. Capcom didn't improve the balance by simply gimping these previously powerful characters. They did it by making everybody in the game a potential powerhouse. Marvel Vs. Capcom 3 makes every character the best character in the game, as long as you're in the right place at the right time. How does it pull that off? Well, it's through a new game mechanic called "X-Factor". Next to the game's new button layout (three attack buttons, two tag buttons, and one special attack "launcher" button) and the option for a even more simplified control option, X-Factor is the biggest game changer of Marvel Vs. Capcom 3. At least, that's how it feels at first. Once you really get going, you realize that X-Factor is by far the biggest new edition to Capcom's superhero fighters ever implimented . It's a game changer, pure and simple. Here's how it works. Once per match, you can activate X-Factor by pressing all four face buttons. While in effect, it increases movement speed and healing, negates all chip damage, and greatly increases the amount of damage that you can put out. The strength and duration of X-Factor is different for every character, but it's true for all characters that the fewer members you have left on your team, the longer and more potent the effect of the X-Factor's. 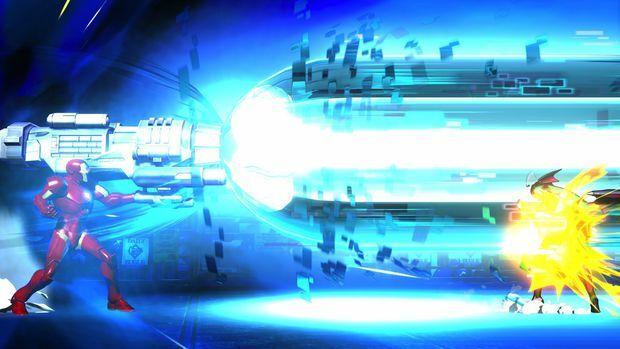 Though you can use it at anytime, the most effective use of X-Factor is to activate it only when you're down to the wire. It's the most powerful "come from behind" mechanic I've seen in a fighting game yet (which is saying a lot considering all the SNK fighters I own). It will be a while before we see just how potentially "unfair" X-Factor is, but for now, I'm loving it. Storm, Sentinel, Doom, and Magneto used to be so overpowered because of the way they can chip at your health while keeping you at a distance via zoning techniques and corner traps. They could feel blatantly unfair in Marvel Vs. Capcom 2, unless you were also using one of the powerhouses yourself. Activate X-Factor with your last character standing, and those traps melt away. 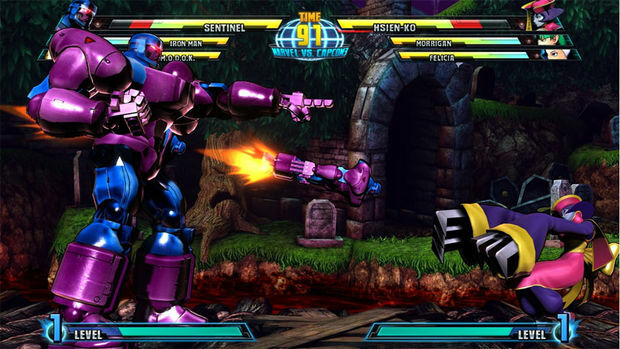 Of course, if either of Storm or Sentinel use X-Factor on you, the chip damage can get pretty ugly, but a skilled played will finish their opponent before the chipping can start. Whether you're dishing it out or taking it, X-Factor makes for more exciting and suspenseful matches. Like a good friend of mine said, it's like Capcom's answer to Mario Kart's blue shell, except this blue shell actually takes skill and practice to properly utilize. Speaking of practice, the game has not one, but two modes that help you to sharpen your skills. With the amount of new characters, combos, and systems added to the game, you're going to need to practice. Practice mode is just your basic "beat on the dummy" routine, and that's fine, but the game's "mission" mode is where most of your real technical growth will probably go down. Each of the game's 36 characters get ten "missions", all designed to teach you how to use that character from step one. The mode gradually walks you through their more essential special techniques, bigger combos, and combination supers. It also shows off what makes each character special. When I first picked her up, I had no idea that Amaterasu could launch an enemy with both a normal attack or a special attack, or that she could change weapons mid-combo for an even more flashy and damaging finish. Mission mode showed me all that, and made it fun in the process. There are a lot more highs and lows to the game I could mention. It's a bummer that there's no spectator option in online mode, and that the last boss fight feels a little flat. Conversely, it's worth noting that the backgrounds look amazing, and the amount of unlockable content (in the form of character bios, character models, movies, and artwork) really keeps you motivated to play during those beginning phases of getting into competitive shape. That's just the start of all the stuff that I've failed to mention in this mammoth review. I want to tell you more, but I've got to cut myself off. Maybe I'll get to the rest in the comments. Before we hit the score, I want to come back to the idea that Marvel Vs. Capcom 3 is it's own animal. The more I focus on its new characters and gameplay innovations, the more I enjoy it. It's just too bad that there's even a need to focus on that. 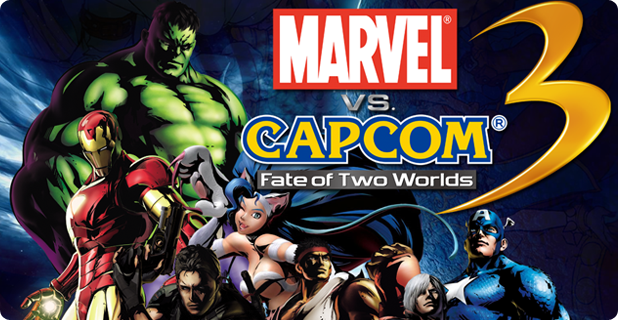 Having so much of Marvel Vs. Capcom 2 left over in this new title really forces the player to make a comparison between the prequel and this sequel. Not only is that comparison not always in Marvel Vs. Capcom 3's favor, thinking about the previous game often works to distract from all of the new things that make Marvel Vs. Capcom 3 so great. 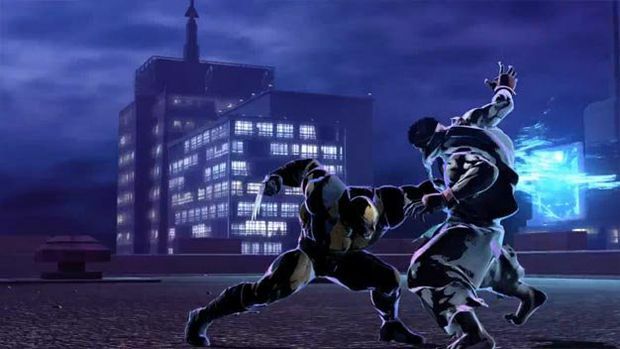 I hope that in time (via either DLC or a whole new title), more and more aspects of Marvel Vs. Capcom 2 will be make their way out of the series, to be replaced with even more of the innovative kinds of game mechanics, concepts, and fighting styles that we're just now getting a glimpse of in Marvel Vs. Capcom 3. In the meantime, we have Marvel Vs. Capcom 3 as it stands, with its all new systems to be mastered, tons of new characters to get to know and love, and more that enough "Marvel" and "Capcom" to go around. That's something that fighting game fans, and Marvel and Capcom fans in general, should have a hell of a time with.